If you’ve ever been to a record store, you’ll know what I mean when I say it is a visual experience. Everything from the atmosphere to cover art creates character and builds excitement as you dig through crate after crate of vinyl. We got in touch with Nick, so he could tell us a little bit about his startup hustle. 1. Let’s start with the obvious! What is your product, what are you trying to sell and who are you trying to target? My product and company is called VinylBlox and basically what I do is create vinyl record storage and handcrafted display solutions. The community I am selling to includes millennials and die hard collectors. There’s a funny stat from 2015 – of the entire North American vinyl purchasing pie, 46 per cent will not listen to their record in the first month, and seven per cent buy records with no intention of listening to them. So my company caters to those people. You buy vinyl because it’s cool, you buy vinyl because when your friends come over you want them to know you own vinyl. VinyBlox is made from 100 per cent reclaimed wood, coated and finished with water based stain, all locally sourced. Everything is reclaimed – I spend zero dollars on materials. All the wood is open sourced, made from throwaway pallets or skids. I’ve been clearing warehouses and breweries of their throwaway palettes and turning them into product. 2. How did this all begin for you? Its funny because back home, vinyl isn’t really a thing, because there’s no retail [value for it] where I’m from. When I moved here to Toronto, I would walk to work and notice vinyl retail shops popping up. I started thinking, “There’s no one offering any options for storage or display.” I was dating a girl at the time who was doing her own jewelry startup, I had made some product and she asked me, “What are you gonna do with it, why don’t you sell it?” I said, “I don’t know anything about that,” to which she said, “Neither did I.” It was the kick in the pants I needed. 3. I think it is really unique that you do all this woodworking from your garage back at home in Elmira. Can you elaborate a bit on your garage studio? How is it going there and why did you choose to start at home? When you start a business there’s a lot of costs, so having the ability to not pay rent for shop space is great! Otherwise, I wouldn’t have been able to get [VinylBlox] off the ground. A lot of the business is contingent on the fact that I have great parents who let me take over the garage at home! It also paints a different image then something that is mass produced in a factory. This is what I do, I make things by the community for the community. Getting out of the shop is something I have coming up [in the future], but I wouldn’t be here without having the shop to begin with. 4. Your background is in radio and media, where did the woodworking come from? My dad is a tradesman, so all the tools have been readily available to me. I’m not a woodworker by trade, but all the tools are there, you can figure out how to use them and if you have an idea, you have the concept and you have it drawn up. You just have to figure out the most effective way to make it all work. 5. What kind of guidance or help did you have starting out? I was fortunate enough to have a very diverse friend group in terms of people having a lot of experience doing different things. I have also been fortunate enough to meet some great people along the way. The whole startup community is great. Once you get to a point where you can validate [what you’ve made to] yourself, the whole community is there to figure out how you can get on board and help someone else. 6. Do you feel like your business has exceeded your expectations at this point? At this point, most, if not all of my profit still goes back into the business. This is in terms of buying infrastructure for the shop and advertising. So would I say that I’ve made it? No, not 100 per cent. But these things can still evolve fairly quickly and once I get to a point where I am turning out product more efficiently, things will become easier. 7. What social media channels do you use to promote your company? The nature of vinyl blends very well to social media, especially Instagram. I got on Instagram right away because thats what vinyl is, its a visual experience. People just have accounts to post pictures of their vinyl, there are thousands of them! It’s a big community for me! Since I’m a one man show, I’ve only recently really gotten up on Facebook and Twitter because there are only so many hours in a day. 8. What does the future look like for VinylBlox? Right now I’m at an interesting crossroads, up until this point I have been trying to get sales wherever I can. Guerrilla style, talking to people, selling things, doing pop up events, going into retail outlets and talking to people. I now have an online shop and it’s about making those business decisions. Do I pursue retail? Or do I put the bulk of my funds into advertising and helping the shop? It’s something I’ve been contemplating but it’s great to have made it to a point where that is a viable decision. That’s something I have to decide. A year ago there was no time for that. Now I can pick my battles and choose where I wanna be and where I wanna go. 9. Does this take away from your work in radio? Radio is something I’m still passionate about, it’s great that I’ve been able to juggle both. But ideally you get to a point where you don’t need to do that, you can outsource or hire to fill these gaps, make things a little easier on yourself. I’ve never met anyone who’s run successful startups who worked 40 hour weeks when they started out, the startup hustle is real. You gotta be passionate enough about the work. 10. What advice would you give someone trying to do their own startup? It’s much the same advice I was given when I started, don’t worry much about the intricacies of figuring it out, if you have a product, the only thing holding you back from making it is yourself. Don’t let your insecurities about your lack of knowledge push you away from doing something you are really passionate about. We are often led astray that there is no time, that we have to do this now. Take the time, take a breath; there is time in the day to figure out what move you need to make next. The things you don’t know you can learn, as long as you’re passionate enough to take the time to do so. We all know that starting a business can’t be easy, being a young entrepreneur in Toronto just heats up the competition. 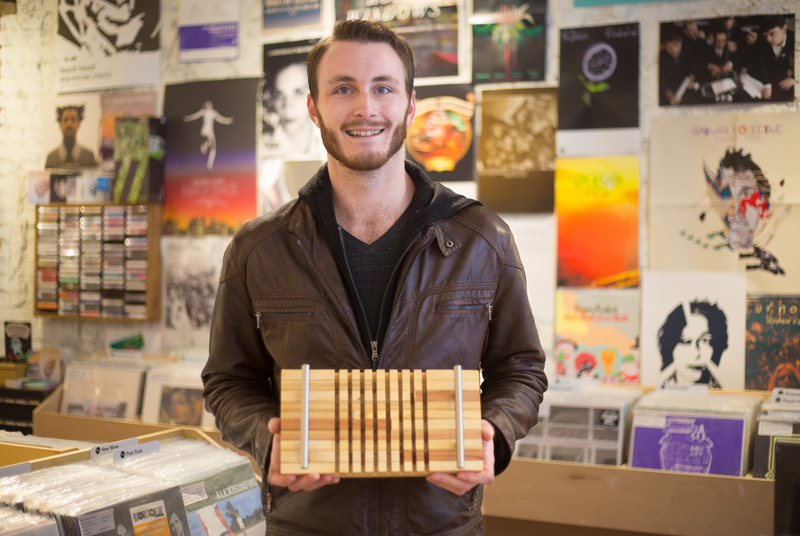 However supporting local, hardworking startup companies is what VinylBlox TO stands for. Follow suit and check out the VinylBlox website! Keep up with them on Facebook, Instagram and Twitter too. Previous If we’re not in control of our wellbeing, who is?